1 Dispose of any open mussels and heat the soya oil in a pot. Fry the onion and the ginger then quench with the wine and the stock. Add the mussels and cook on a medium heat with a lid on for 8-10 min. 2 Blanche the bok choy in salt water for about 5 min. Rinse and drain. 3 Dispose of any closed mussels and remove the meat from the opened shells. Season the mussel broth with oyster sauce and soy sauce. 4 Fry the ham in the vegetable oil until crispy and pat dry with kitchen paper. 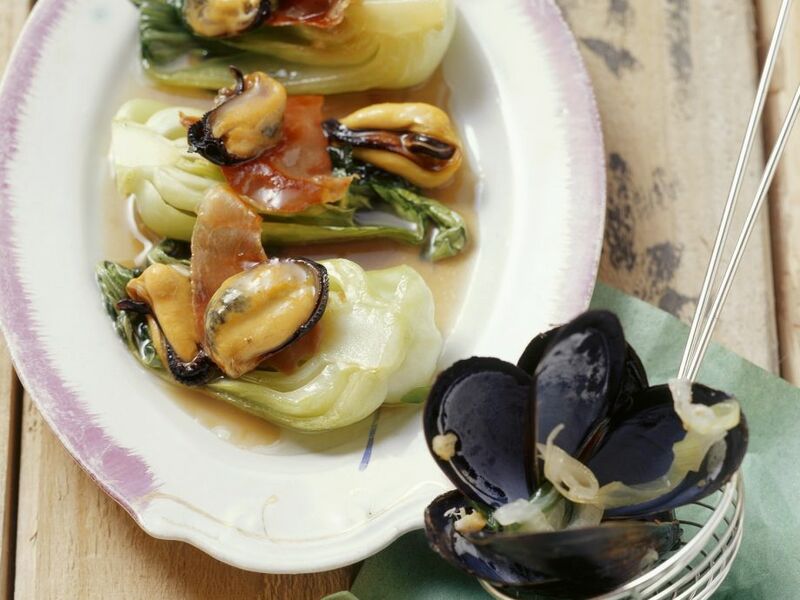 Arrange the bok choy on plates and top with 2 mussels and a piece of ham. Serve drizzled with the mussel broth.